With over 135 2D and 3D assets in 4K resolution and organized into 7 different categories, each element can be previewed and downloaded at will. Hud Elements 4K is a versatile solution for building your own uique high-tech motion graphic displays for a wide variety of projects. 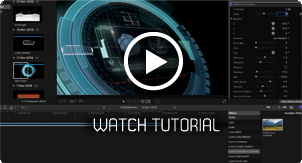 * Click on the above image to watch the Hud Elements 4K Tutorial programme. Compatible with all versions from 2009 onwards of After Effects, Premier Pro, Avid Media Composer, Final Cut Pro 6/7, Final Cut Pro X, Apple Motion 5, DaVinci Resolve, Edius Pro on PC and Mac. A 1GB graphics card and 2GB of RAM are recommended. The current date and time is Tue 23rd April 2019 :: 02:11:04 at Luca Visual FX Studio in London.